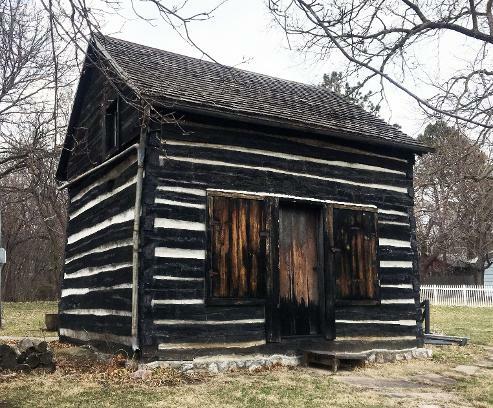 "While researching the history of Nebraska City, I came across a unique cottonwood cabin that was located along Highway 2 named the Mayhew Cabin. I was immediately attracted to the colors and repetition that existed within the structure and began my research on the history of this particular space. I learned that the Mayhew Cabin is the only Underground Railroad site in Nebraska officially recognized by the National Park Service. It is also included among the sites of the National Underground Railroad Network to Freedom. The cabin was considered a place of refuge for enslaved individuals seeking a place to rest on their journey to freedom. It is a place where people stood firm against the injustice of slavery. I was able to walk through the original 1850's cabin and travel down the 1930's reconstructed cave and tunnel area underneath the structure to experience the sights and sounds of what it could have been like in that environment for those individuals seeking freedom. I was happy to connect with the Mayhew Cabin historian to discuss the possibility for me to do a site-based, site-responsive interpretation of my Soundstitching of the Mayhew Cabin. I am very thankful that I was able to spend the day alone within the cabin and exist among the energy of this space for a day during my residency time at the Kimmel Harding Nelson Center for the Arts." The documentation of stitching and interpreting the Mayhew Cabin can be seen in the film below. To learn more about the history of the Mayhew Cabin, please click here. The documentation of creating the Mayhew Cabin interactive, sound soft sculpture can be seen in the film below. I cannot thank the Kimmel Harding Nelson Center for the Arts enough for awarding me time to make work at their residency and have the opportunity to share my work through a solo exhibition in their gallery. The Kimmel legacy looks back to when John Kimmel acquired the Kimmel Farms in Nebraska City in the 1850s. Some 75 years later, his grandson, Richard P. Kimmel, assumed management of the family farms and in 1925 established the Kimmel Orchard just outside the city. In a lifetime devoted to care of the land, both Richard and his wife, Laurine, herself a painter, committed themselves to the development of their community and the best in human endeavor. The foundation they established now provides important support to charitable causes in Nebraska and Iowa with highest priority given to proposals in education, the arts, agriculture, human services and the humanities. Endeavors undertaken by the foundation in Nebraska City such as the Kimmel Orchard and Vineyard, the Kimmel Education Research Center, the Kregel Windmill Factory Museum, and the Kimmel Harding Nelson Center for the Arts continue to bring the dreams of Richard and Laurine to life. More information can be found on the Kimmel Foundation's website.